All signage is to be displayed in the English language, with a direct or near direct translation into another language using smaller letters or characters must not exceed more than 30% of the overall size of the English language text. The proposal raises two important questions. Is English the “official language” of Australia? And what is the status of community languages other than English? English is sometimes described as the “national”, “main” or “common” language, and as a “tool for integration”. But Australia has no policy designating English as an official language. Australia’s multicultural policy also has surprisingly little to say about languages. There is no official protection for languages other than English. all institutions should “recognise the linguistic and cultural assets in the population of New South Wales as a valuable resource and promote this resource to maximise the development of the State”. How does regulating signs live up to these principles? Mandating English signage and allowing limited translation amounts to a de facto policy of English as an official language. It signals, in effect, an attitude of multicultural tolerance, not a policy of active multiculturalism. The Strathfield proposal has attracted the interest of some mainstream media and the local English and community language press. However, media reports have muddied the waters by using the term “foreign” languages. Critical comments on social media have questioned whether the policy would ban established English words like “pizza” and “kebab”. Such reports and comments highlight the difficulty of regulating use of languages on signs. They also miss the underlying issue of the right to use languages other than English in Australia’s multilingual communities. The 2016 Australian Census shows that more than 300 languages are spoken in Australia. In Sydney, 35.8% of people speak a language other than English at home. Languages are part of the social fabric of everyday life in the city. In Strathfield itself, 68.5% of the households speak one of 58 languages in addition to English. The biggest language groups are Chinese (Mandarin and Cantonese), Korean, Tamil and Arabic. These are not “foreign” languages in Strathfield; they are the everyday languages of a multicultural community. 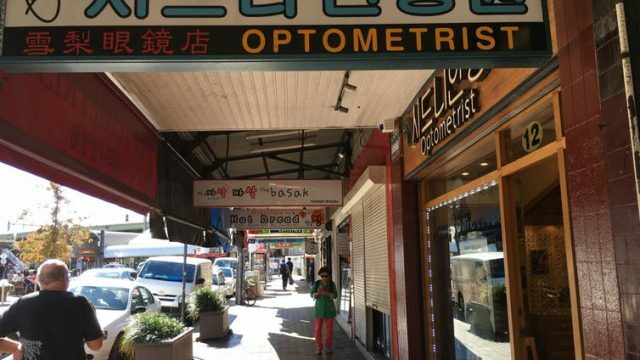 Our research in Strathfield’s commercial centres shows the proposal will mainly affect businesses that display Korean and Chinese script. Most of these businesses already have bilingual or trilingual signage. Signage for one barbecue shop shown here includes Japanese, Chinese, Korean and English. Why does the language on signs matter? the right to use a written language in public is equivalent to the right to use a spoken language. When speakers of languages other than English are abused for speaking their languages in the street, we are quick to label this as “un-Australian”. Is it not equally “un-Australian” to regulate written language use? The Strathfield proposal is open for public consultation until June 15. It might not ultimately be implemented. Yet it raises enduring questions about the place of language in Australia’s multicultural policy. The Turnbull government’s first policy statement on multiculturalism, Multicultural Australia: United, Strong, Successful, stresses that the economy is “strengthened by the skills, knowledge, linguistic capabilities, networks and creativity of our diverse workforce.” So, should local policies on signage in multicultural Australia be limited to tolerance of community languages within an English-dominant framework? Or should these policies recognise the right to expression and full participation for everyone? Alice Chik is a Senior Lecturer in Literacy at Macquarie University Philip Benson is the Professor of Applied Linguistics at Macquarie University.